Business-to-business marketing (B2B marketing) is the process of marketing products or services to other businesses. Closing a B2B sale usually takes time because the purchase process involves several layers of decision-making. B2B copywriting is the creation of content to convey your brand authority, share information and communicate complex messages. The aim of B2B copywriting is to generate leads and eventually close sales. To do that, your copy needs to relate to the B2B buyer or the decision maker. Informative. Your content needs to be useful, valuable and educational. Offer fresh perspectives, analysis and meaningful information. Concise. B2B buyers are busy people – they don’t have a lot of time on their hands. Your content needs to be succinct and to the point to capture their attention. Professional. Unlike B2C, marketing to a B2B audience usually requires you to adopt a professional tone. The key is to strike a balance – be authoritative yet personable enough to bring you closer to your audience. Targeted. Your B2B literature should resonate with your audience’s profile. Recognize their issues, understand their motivations and address their concerns. Strategic. Your B2B content should have clear objectives and tie in with your overall marketing strategy. It should also be consistent with your brand position. What are the benefits of B2B copywriting? Explain complex information in a clear and concise manner. Communicate your company’s unique qualities and build credibility. Develop PR outreach by creating newsworthy content. Engage your audience and nurture customer relationships. Increase website traffic and improve your search engine rankings. Enhance conversions and increase sales. Improve brand awareness and position you as an industry leader. Enhance visibility over your competitors. What is the downside of not using B2B copywriting? B2B copywriting requires a unique set of skills and insights. Take white paper writing as an example. White papers focus on educating, rather than selling. They call for a special level of expertise – you need to be able to translate complex concepts into easy-to-understand copy. If you’re not able to strip out the jargon and write in plain English, you could end up turning off your readers instead of striking a chord with them. B2B buyers make decisions differently. As you’re communicating with a business audience, their needs and wants are different. This calls for an intimate understanding of the customer. If your copy is not smart and targeted, it will not resonate with your audience. This could cost you potential sales. Work with you to define your marketing objectives. Create relevant and persuasive content that fits with your overall content marketing strategy. Help you to create compelling messages to best position you as an authority in your field. Write content that helps you connect with your customers and that drives action. Make complex concepts easier to understand. Why should you hire a B2B copywriter? A B2B copywriter is skilled at distilling advanced concepts and turning them text that’s easier to understand. But not all good marketers make good writers. If you lack the competencies to write top-notch B2B copy, outsourcing your writing to an experienced B2B copywriter is your best option for getting that professional content you need for your B2B marketing project. This also frees up your time, allowing you to devote your energy to other areas which may require your attention. For a start-up founder, this may mean having more time to grow the business. For a marketing professional, this may mean being able to attend to other pressing deadlines or tasks. And if you have limited funds, outsourcing to a freelance copywriter relieves you of the overheads that come with having someone on board full time. You get your B2B content as and when you need it. 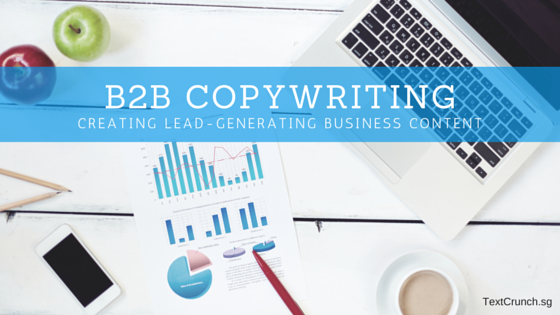 How can B2B copywriting help your business? Smart B2B copywriting helps you to generate the right kind of leads. The right copy helps to keep your prospects warm and keeps your business top-of-mind. By understand your target audience, B2B content can address the needs, interests, challenges and concerns of the people you are trying to sell to. Carefully crafted copy gives your prospects the answers they are seeking. B2B content also acts as your sales catalyst. The right call to action strategically placed within your copy can drive action and help you win over more customers. In short, B2B copywriting can give your business a boost. The more leads you get, the more conversions and the more sales for your business. Do you need professional B2B copy? Get in touch with us now to discuss your B2B copywriting needs.